The Canadian men’s skeleton team for the 2014 Winter Olympics in Sochi, Russia will only have two athletes, and one of them will not be named Jon Montgomery. Until recently many people, myself included, assumed that Jon would be there. Why wouldn’t we? He is the reigning gold medalist, he was the fastest Canadian in the recent training runs at the Olympic track in Sochi, he’s had the most World Cup success of any of the current Canadian sliders, and he is featured in virtually every Winter Olympic ad that you’ve seen in Canada. 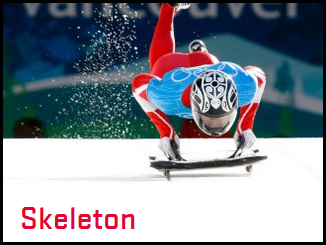 Even today Jon with his turtle helmet is prominently displayed on the official Canadian Olympic Committee web site. A number of factors conspired to keep Jon off the team, including equipment issues, coaching decisions, some poor results in key qualifying races, and a little bit of bad luck. After his dramatic win in the 2010 Vancouver Olympics, Jon took the bold step of completely redesigning his equipment from scratch. Building the fastest sled in the world from the ground up, and becoming proficient with it, is a long and difficult process. There were some setbacks along the way, but his results started to improve and momentum began building with Sochi on the horizon. Unfortunately some poor qualifying runs hurt Jon’s standing in the Canadian Olympic Team pecking order. Two capable sliders — Eric Neilson and John Fairbairn — were already on the team. A third spot was available for Team Canada, but only if sufficient points were earned in international competition to keep that spot out of Russian hands. There were two men on the Canadian team battling for that spot: Dave Greszczyszyn and Jon Montgomery. With only one remaining position on the World Cup circuit, the coach Duff Gibson, a former Olympic racer himself, had a big decision to make. Jon had the stronger results leading up to Christmas with two solid 6th place finishes in contrast to Dave’s 20th and 26th placings, but Gibson chose to keep the less experienced Greszczyszyn on the World Cup circuit, leaving Montgomery on the Intercontinental Cup circuit where far fewer points are available to be earned. Dave did not get 13th in his races. In fact, while Jon was standing on the podium in Whistler on the IC circuit, Dave was at the bottom of the board at the World Cup race in Germany. Greszczyszyn’s performance at the World Cup events did not earn enough points to retain the third spot at the Olympics, which now belonged to Russia. With few World Cup races remaining, and having lost their right to send a third male Skeleton racer to the Olympics, Duff Gibson made a late call to yank Dave Greszczyszyn off the World Cup circuit and send Jon Montgomery back up in the hope that he could regain that Olympic spot. It was a tall order, but the ever optimistic Jon rushed from Whistler BC to St.Moritz Switzerland to try to take advantage of this opportunity. Suffering from jet lag, using borrowed equipment because some of his was misplaced by the airline, and having missed four of the six training runs because of the travel, the results in Switzerland were not what he hoped for. The final chance to get back on the team and defend his gold medal came this past weekend in Igls, Austria, but the stars needed to align perfectly. He had a good weekend, but not good enough. Finishing as the top Canadian and 7th overall still left Jon 24 points shy of the Russian slider that held the third Olympic spot. You will never hear Jon blaming anybody else for his misfortune, but many people will look back and question the decision made by Canadian coach Duff Gibson at Christmas to keep Greszczyszyn, a racer with no prior World Cup experience, on the World Cup circuit in place of Olympic Champion Jon Montgomery. Those people will wonder what might have happened if Jon had been given the opportunity to earn World Cup points right from the start of 2014. Would he have made the team? Would he have earned Canada another Olympic medal? These are things we will never know the answers to. What we do know is that the man who is probably Canada’s best hope at an Olympic medal in Skeleton is not going to be in Sochi. While you won’t see Jon at the Sochi Olympics, you can still see him this summer as host of The Amazing Race Canada on CTV.